Mount Rushmore National Memorial, a massive sculpture depicting four U.S. presidents, was carved into Mount Rushmore in the disputed Black Hills region of South Dakota. In the wake of racial violence in Virginia sparked by the planned removal of a statue of Confederate General Robert E. Lee, cities across America have removed or relocated a number statues and monuments that speak to a history of racism in the United States. But Native American commentators say far less attention is given to monuments commemorating historic figures responsible for centuries of violence and suppression of their ancestors. The first monument to the Italian explorer was erected in 1792 to mark the 300th anniversary of Columbus’ so-called “discovery” of America. Dozens of Columbus monuments exist across the U.S. Native Americans view him as the man who opened the door to the genocide of their ancestors. 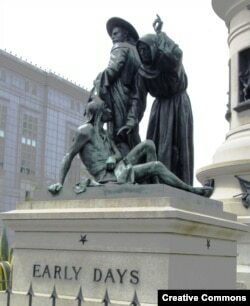 Detail of Pioneer Monument in San Francisco, California, dedicated in 1894. Native Americans see it as a symbol of the forced conversion and assimilation of Southwestern tribes by Spain and the Catholic Church beginning in the 16th century. This granite and bronze statue, completed in 1897 by sculptor F.H. Happersberger, depicts a half-naked “Indian” sitting submissively at the feet of a Spanish settler and a Catholic priest. Spanish Franciscan missionary priests set up missions across California, where they imposed their faith upon “heathen Indians,” often by force. Later, Catholic boarding schools were the chief instrument of forced assimilation into Christianity and Western culture. • The Bear Hunt Statue, erected at the California School for the Deaf in Fremont, was sculpted in 1892 by Douglas Tilden. Serra is known as the man who brought Christianity to California 300 years ago, founding nearly two dozen missions set up to convert and “civilize” tribal people. Tribes see nothing to celebrate: Historic documentation shows that Serra - who was named a saint in 2015 - enslaved and tortured Native Americans into abandoning their religions and culture. 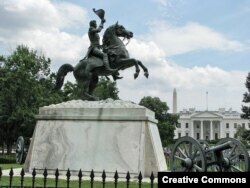 The Andrew Jackson statue, erected in 1853 in Lafayette Park, is opposite the White House in Washington, D.C. Native Americans sometimes refer to the 7th U.S. president as "Indian Killer." • Andrew Jackson Monument, Washington, D.C.
Sculpted in 1852 by Clark Mills, the statue is dedicated to the controversial seventh U.S. president. Jackson oversaw the forced removal of Creeks and Cherokee from their homelands in Alabama, Florida, Georgia, North Carolina and Tennessee along a westward “Trail of Tears” in which thousands of tribal people died. His action paved the way for the cotton industry in the South, built on the backs of African slaves. “And is it supposed that the wandering savage has a stronger attachment to his home than the settled, civilized Christian?” Jackson asked at the time. 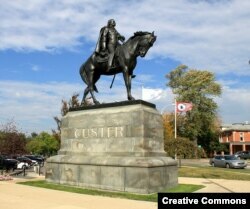 George Armstrong Custer Equestrian Statue, "Sighting the Enemy", erected in Monroe, Michigan in 1910. Custer was defeated by Lakota, Cheyenne, and Arapaho warriors in the Battle of Little Bighorn, or “Greasy Grass,” as the Plains tribes call it. Originally celebrated as a great American hero, Custer’s reputation has tarnished over time. He ordered an Army attack on a village of 10,000 Sioux, Cheyenne and Arapaho camped along the Little Big Horn River, killing hundreds of their horses. Tribal warriors struck back, wiping out Custer’s army. Custer had earlier discovered gold in the Black Hills and historians say he was driven by a desire to violate an 1868 treaty and drive the Lakota onto reservations. This sculpture was carved directly into the face of a mountain in the Black Hills region of South Dakota, in treaty land retaken by the U.S. government. The resulting legal dispute continues today. Carved into the face of a mountain Sioux tribes call “Six Grandfathers,” the memorial depicts four U.S. presidents — George Washington, Thomas Jefferson, Abraham Lincoln and Theodore Roosevelt. “Carving icons of presidents who were known for their insensitivity to Indian issues into a living sacred mountain would be similar to painting anti-Christian graffiti inside of a cathedral, or anti-Semitic symbols inside a synagogue,” reads a post in Native American Netroots blog. Eleven meters tall on a two-and-a-half-meter base, the world’s largest bronze equestrian statue was sculpted by John Sherrill Houser to honor the conquistador who established the colony of New Mexico for Spain in the late 16th century. He is best known for a punitive two-day expedition against the Ancoma Pueblo, in which as many as 1,000 Acoma died “by fire and bloodshed.” The $2-million statue was erected in 2006 at the El Paso International Airport where, it was believed, it would escape vandalism; a few years earlier, Native American activists removed the right foot off of a smaller statue of Onate in north Espanola, New Mexico, a reference to the fact that de Onate once ordered his men to cut off the feet of all Acoma men over the age of 25.